We have 10 copies to give away! 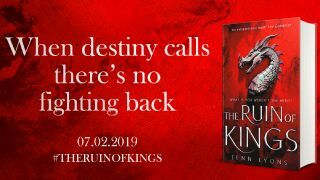 Debut author Jenn Lyons’s fantasy novel The Ruin of Kings centres on 15-year-old minstrel’s apprentice Kihrin, whose life is turned on its head when he’s claimed as the lost heir to a grand house. Good news? Yes and no, since this puts him at the centre of an ancient prophecy, and now every side – from gods and demons to dragons and mages – want him as their pawn. The Ruin of Kings is available to buy now, as a hardback, ebook or audiobook. Thanks to Tor we have 10 hardbacks to give away. To put your name in the hat for the chance to win one, simply answer the question below.